So what is a healthcare venture capitalist doing posting a list of his favorite albums? Well, if the Pope can do it, why not me? As some of you know I spent much of the past decade as a partner/investor in an artist management business, Miles High Artists, with one of my best friends (and a great artist in her own right) Diane Gentile. Diane was the music industry insider of the partnership. I was just a music fan and businessman that sought to add some value to the careers of up and coming artists. Over the course of the decade I was involved in the making, recording and/or marketing of 10 studio albums, all of which I am extremely proud of. Diane and I successfully secured record contracts for five artists and all of the artists we worked with continue to actively write, record and perform music today. It was a great experience, and some of the artists remain among my best friends. So, as you might imagine, I listen to a lot of music, and I thought it would be fun to put together a list of my 10 favorite albums of the decade. Now the list ultimately stretched to over 60 albums, and almost all of the 60 will be referred to in my notes related to the top 10. The top 10 were chosen from the longer list because not only do I absolutely love them, but I believe they influenced a lot of the music of the decade. As I have a lot to say about each of these albums, I am releasing the list one at a time as part of “Casual Fridays,” starting today with number 1. I was three years old when the Beatles released Revolver and Sgt. Pepper, coming to them as a pre-teen and well after the initial shock and awe. Despite decades of listening to new music it was not until Kid A’s release that I experienced the incredible energy of hearing something that felt so different and yet so immediately great. Kid A opened my ears to a whole new way of listening to music and, in retrospect, influenced an entire decade of new music exploration. In this past decade Radiohead reinvigorated and re-commercialized progressive rock music through the release of three masterpieces, Kid A being the first. I could easily place the other two (masterpieces that is, the other release of the decade, Hail to the Thief, was not, in my opinion as strong an effort), Amnesiac or In Rainbows, in the number one spot (personally, I listen to Amnesiac more than the others). Kid A makes my top 10 because it came first, and as such it deserves special recognition for shepherding new production techniques, beats and electronics into alternative rock music and for creating the openings in our ears necessary to accept the experimentation of bands like Animal Collective, The Dirty Projectors and even Wilco. 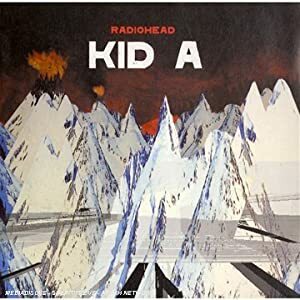 Kid A is number 1 on my list because I believe it is the most influential rock album of the last decade. Favorite Track: “Optimistic” – because “the best you can is good enough” (maybe). OK Computer and The Bends, Radiohead’s masterpieces of the 1990s provide ample competition in answer to the question: what is Radiohead’s greatest album? (And yes people ask this question often). “Pyramid Song,” the second track on Amnesiac, released one year after Kid A, might be Radiohead’s coolest song. I remember hearing (seeing) them play it live and leaving the show with a complete absence of self-confidence. Along with its haunting piano riff, the track baffles musicians determined to decode it’s time signature, which Wikipedia posts as 16/8 (which is like 4/4, the most common time signature in rock, nonetheless, the beat is confusing and unique, check it out below). Icelandic band Sigur Ros is clearly a major influence on Radiohead, both on Thom York’s vocal style and the Greenwood brother’s orchestrations. Sigur Ros has released two outstanding albums, namely Ágætis Byrjun in 1999 and “( )” in 2002. Radiohead’s guitar player, Jonny Greenwood, wrote the soundtrack to the Paul Thomas Anderson film, There Will Be Blood, by far the most interesting movie soundtrack I have heard in a long time, and maybe my favorite movie of the decade (another list perhaps?). Other notable prog-rock records of the decade include: Porcupine Tree – In Abstentia, Tool – Lateralus, Muse – Black Holes and Revelations and The Standard – August.